Smart entrepreneurs are doing good business in exciting new ways. They’ve taken the sound business development ideas and practices of the 20th century to a whole new level, and are profiting from doing business the way nature does business – with reusable materials, low energy processes and smarter, localised solutions. 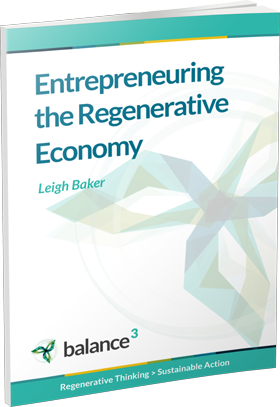 The principles that regenerative entrepreneurs have been turning into profitable strategy are straightforward. They do fundamentally shift the way we think about the relationship between our ecosystem and the products and services we deliver using its resources. At the same time, they’re based on the core of any business – increasing value to customers and increasing profits. 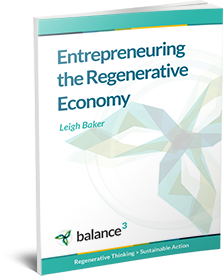 We teach your key players the core principles of regenerative business and workshop how best to apply them to your business in your industry. In a series of interactive learning sessions, we connect mainstream thinking with new applications, so your team understands how to turn ideas into action in your market place. We’re regenerative business coaches – not consultants. Our objective is to transfer new thinking about business, the environment and the supply chain into your organisation. So these sessions are challenging and interactive. We aim to tune your business into your opportunities and develop initial strategies and tactics. So bring your smartest operators and brightest thinkers. The core of this program is 6 x 3 hour workshops. They can be run back-to-back as a 3-day intensive program; run in pairs to deliver 3 x 1-day workshops; or run as 6 x half-day sessions. Total cost depends on group size, venue costs, catering and session overheads.